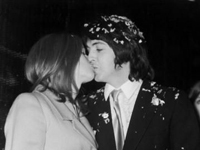 Paul McCartney and Linda Eastman were married on March 12, 1969 in a civil ceremony at the Marylebone Register Office. Their marriage was blessed at St. John’s Wood Church near London, England with Paul’s brother Michael McCartney (also known as Mike McGear) as best man. Linda wore a fawn beige dress with a pale daffodil yellow coat. Paul wore a gray suit with a yellow tie. Hundreds of people gathered outside the Marylebone Register Office to catch a glimpse of the couple as they arrived with Linda’s six-year-old daughter, Heather, from a previous marriage. A dozen policemen were on hand to fend off enthusiastic teenagers, many of whom were distraught that the last remaining bachelor Beatle was tying the knot. The couple entered the building via a side-door to the disappointment of many of the crowds. The ceremony was delayed because the best man, Mr McCartney’s brother Mike McGear, arrived late. After the ceremony the newly-weds were ushered through the crowds into a waiting car and driven away to their local parish church where the marriage was blessed. Paul and Linda honeymooned in the U.S. They took Linda’s daughter Heather with them on their honeymoon. Linda and Paul met on May 15, 1967 at the Bag o’ Nails in London. Paul claims he was attracted by Linda’s smile. She went back to New York City, and they didn’t meet again until a year later. Paul said, “Across a crowded room, as they say, our eyes met and the violins started playing … There was an immediate attraction between us. As she was leaving — she was with the group the Animals, whom she’d been photographing –- I saw an obvious opportunity. I said: “My name’s Paul. What’s yours?” I think she probably recognized me. It was so corny, but I told the kids later that, had it not been for that moment, none of them would be here. Later that night, we went on together to another club, the Speakeasy. It was our first date and I remember I heard Procol Harum’s A Whiter Shade of Pale for the first time. It became our song.” Source: “Sir Paul McCartney on Linda”, TimesonLine.co.uk, 4/06/08. Linda said, “It was at the Apple press conference that my relationship with Paul was rekindled. I managed to slip him my phone number. he range me up later that day and told me they were leaving that evening but he’d like it if I was able to travel out to the airport with him and John.” Source: Linda McCartney, Linda McCartney’s Sixties: Portrait of an Era, page 146. Linda Eastman was born in 1941 in New York and was educated at the prestigious Scarsdale High School. After leaving school, she trained as a photographer and throughout the 1960s has photographed many famous names, including Jimi Hendrix, The Doors, The Who, Bob Dylan and Otis Redding. Paul McCartney was born in 1942 in Liverpool and had written his first song, I Lost My Little Girl, by the age of 14. The Beatles were formed in 1960 and by 1963 Beatlemania had gripped the country. Heather Louise See McCartney, born December 31, 1962 in Tucson, Arizona. In 1969 Paul adopted Heather after his marriage to Linda. Birth father: John Melvin See, Jr.
Mary Anna McCartney Donald, born August 28, 1969 in London, England. Marriage: Mary Anna married Alistair Donald on September 26, 1998. The couple separated in April, 2005. Children: They have two sons, Arthur Alistair Donald who was born in 1999 and Elliot Donald who was born in 2002. Stella Nina McCartney Willis, born September 13, 1971 in London, England. Occupation: Fashion and costume designer. Stella designed Madonna’s wedding dress. Marriage: Stella married publisher Alasdhair Willis on August 30, 2003 in Scotland. Children: They have a son, Miller Alasdhair James Willis born in 2005 in London, England. James Louis McCartney, born September 12, 1977. Linda’s first marriage was to John Melvin See, Jr., a geologist, who she met at the University of Arizona. They married on June 18, 1962, had a daughter together, separated in 1964, and later divorced in June 1965. John See committed suicide in 2000. Paul’s second marriage was to Heather Mills. They married on June 11, 2002 and were divorced on March 17, 2008. They have one child. Beatrice Milly McCartney: Born on October 28, 2003. Paul: “Every love song I write is for Linda.” Source: “Linda Louise Eastman McCartney.” The Scribner Encyclopedia of American Lives, Volume 5: 1997-1999. Charles Scribner’s Sons, 2002.